HEATHER HAVRILESKY is the author of How to Be a Person in the World and the memoir Disaster Preparedness. She writes the "Ask Polly" column for New York magazine, and has written for The New Yorker, The Atlantic, The New York Times Magazine, and NPR's All Things Considered, among others. She was Salon's TV critic for seven years. She lives in Los Angeles with her husband and a loud assortment of dependents, most of them nondeductible. "Wise, wry essays on the false promise of self-help, the emptiness of materialism, and the beauty of the 'imperfect moment.'" "What If This Were Enough? feels cathartic.... Havrilesky's book is hilarious and pulls no punches, and its cohesiveness feels fresh." 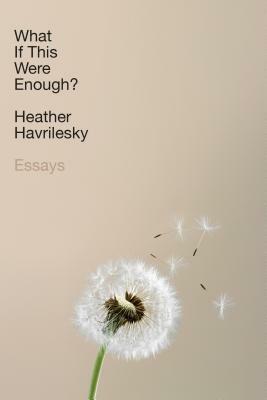 "Insightful, intelligent, and with trademark honesty, the book (and Havrilesky through it) seems to want to grant us all permission to feel deserving of, and happy with, our lots in life." "Heather Havrilesky is a singular talent and an indomitable force. When it comes to the tension between thinking and feeling, of being out in the world and being alone with yourself, there is no one sharper, wiser, funnier, most honest, or more insightful. In What If This Were Enough, readers will find a splendid mix of Havrilesky’s familiar and intimate 'Ask Polly' voice and the authority and erudition of a seasoned cultural critic. I couldn’t get enough." "There's an effortlessness to Heather Havrilesky's writing that is incredibly rare. Her funniest sentences are still empathetic. Her darkest confessions are still pretty funny. It doesn't seem to matter what she's writing about, or what point she's trying to make. She's just good at it." "Heather is that dear friend you run into at a bad party at which you’re stuck and you say ‘Oh thank God you’re here’ and spend the rest of the night making dark and hilarious jokes about the party, other attendees, and the human condition. Thank God she’s here."